Just before the strawberry season ends here in Oregon I wanted to get a few jars of jam done that I can enjoy throughout the year. 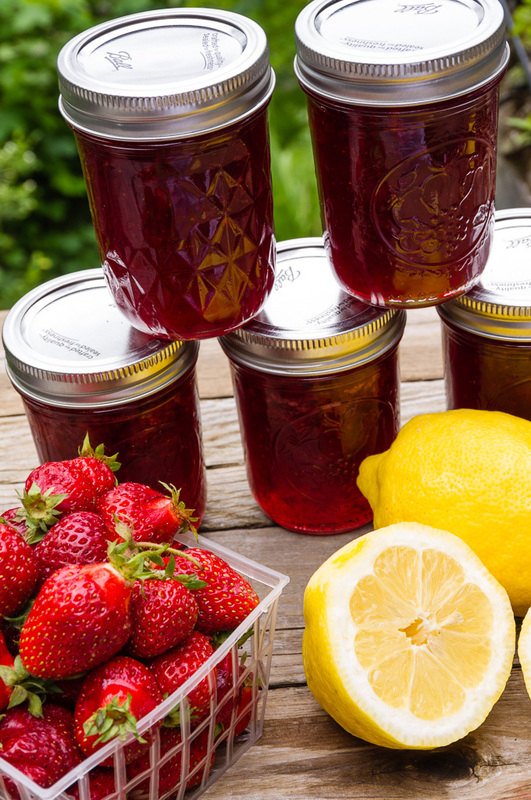 I always make my family’s favorite Strawberry Lemonade Jam, with every bite you get that fresh strawberry taste with pieces of lemon peel. 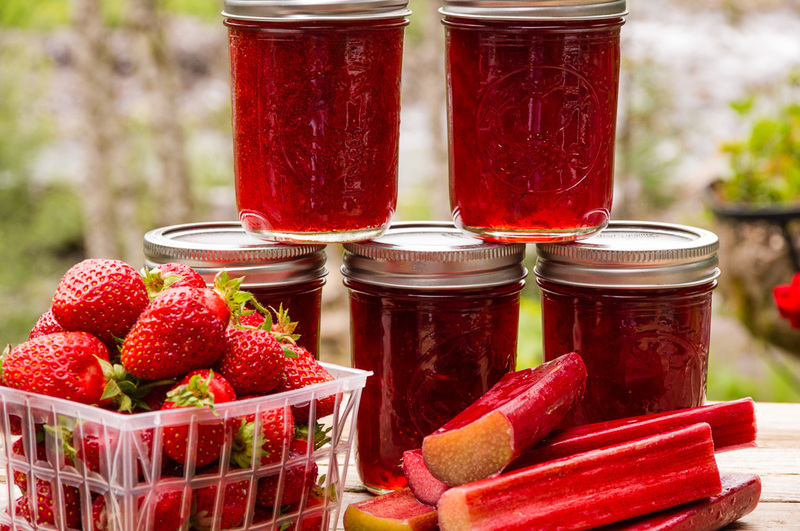 But this year I decided to add a new flavor to my canning shelves, Strawberry Rhubarb Jam. I really have never attempted to use Rhubarb in any of my baking or canning. I always see the overflowing displays at the farmers markets but always thought of it as bitter. So with my stalks of rhubarb in hand I was on my way to a new adventure. I have to tell you 16 jars of jam and 1 strawberry rhubarb crumb top pie later I am a changed person. Rhubarb is great and easy to work with and to me brings out the flavors in the strawberries. If you have never cooked or baked with Rhubarb this is the year to give it a try too! In small saucepan combine orange peel and water to cover. Bring to a boil over medium-high heat for 5 minutes. Drain and discard water. 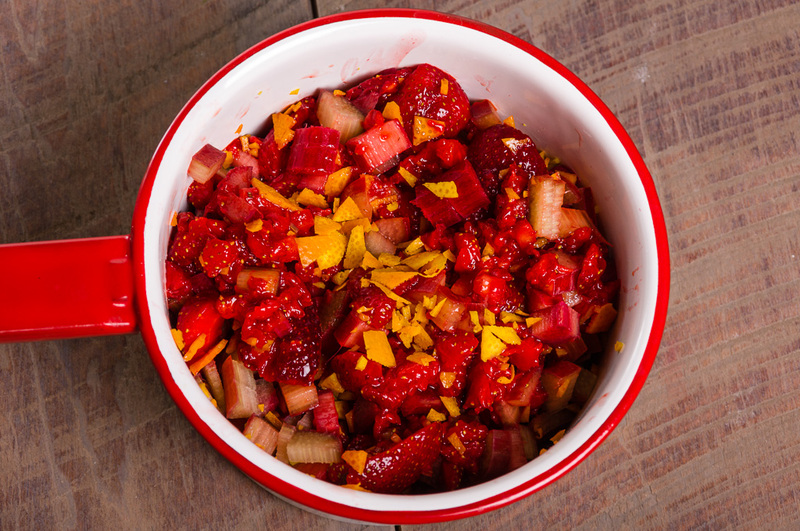 Combine strawberries, rhubarb, orange peel, pectin and lemon juice in a large saucepan. Whisk until the pectin is dissolved. Bring to boil over medium high heat. Add sugar and butter, stirring until dissolved. Return to a rolling boil. Boil hard for 1 minute, stirring constantly. Remove from heat. Skim off foam if necessary. Ladle hot jam into hot jars, leaving 1/4-inch headspace. Wipe the rim of the jar to remove any jam that may have fallen on it. Adjust two-piece caps. Process 10 minutes in a boiling-water canner. Recipe adapted from ~ Ball Blue Book ~ This is my canning bible! In small saucepan combine lemon peel and water to cover. Bring to a boil over medium-high heat for 5 minutes. Drain and discard water. Combine strawberries, lemon peel, lemon juice and pectin in large saucepan. Whisk until the pectin is dissolved. Bring to boil over medium-high heat, stirring constantly. Add sugar stirring until dissolved and bring back to a rolling boil, stirring constantly. Boil hard, stirring constantly for 1 minute. Remove from heat and skim off foam if necessary. Ladle hot jam into hot jars, leaving 1/4-inch headspace. Wipe the rim of the jar to remove any jam that may have fallen on it. Adjust two-piece caps. Process 10 minutes in a boiling-water canner.